Posted July 2, 2015 by Alannah Maher & filed under Arts & Entertainment, Featured Arts & Entertainment. The function of art and culture, in all its various forms, has a profoundly positive and immeasurable impact on Australian society. The recent budget announcement however, of $105 million worth of funding cuts to the Australia Council for the Arts, has various branches of the arts sector fearing for their future. Meanwhile, DirtyFeet, a not-for-profit contemporary dance organisation is preparing a program for up-and-coming choreographers in the face of an uncertain funding future. 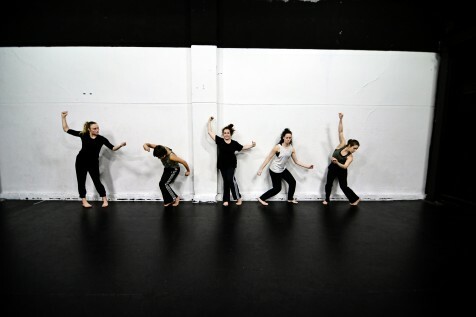 Out of the Studio (OOTS) is an initiative bringing the works of two young choreographers, Rhiannon Newton and Rosslyn Wythes, ‘out of the studio’ and ‘onto the stage’. DirtyFeet Director Anthea Doropoulos is confident that we will be hearing the names of these talented women in the future. Newton’s choreography proposes that we are automatically a ‘group dancing machine’; her work tunes into the processes of repetition, calibration, togetherness and slippage naturally at play between bodies. Whereas Wythes’ choreography explores energy moving through the body and through a group of bodies; collective and individual desires will take these bodies sweeping and sliding through the space, transforming the landscapes we see. This is the second year of OOTS, a proven launch pad for the careers of other dance professionals; this would not be possible without funding. “We’ve been quite happy with the way things have been going, however with these cuts we are fearful of what is going to happen,” said Anthea. Currently, funding from Arts NSW covers a majority of the costs, in addition to DirtyFeet’s own box office sales, merchandise and own fundraising initiatives. It is rare for opportunities of paid, career-building employment to come along for emerging artists. The program pays a full time wage to the choreographers and their dance teams for three weeks of rehearsal that culminates in an evening showing followed by a question and answer session. New pressures on arts funding means that it will be much more competitive when DirtyFeet seek to reapply for the funding that has allowed them to foster the future of Australia’s dance arts. OOTS is not the only grass roots program whose future has been made uncertain by the proposed shift in arts funding. Paula Abood, a community cultural development artist who works with diverse communities across Western Sydney, was motivated to join the organisers of Our Future In Our Hands because of the threats to her work and the communities she assists. “I feel that this change is so radical that it will transform the sector for the worst,” she said. The millions of dollars worth of funding proposed to be cut from the Australia Council is intended to be transferred to the newly established National Programme for Excellence in the Arts (NPEA), with it’s funding decisions resting with minister George Brandis. Paula works with communities to build capacities through art, through her work she has helped people from marginalised and disenfranchised backgrounds (refugees, the homeless) use artistic mediums of storytelling as powerful tools to facilitate conversation, nurture and educate. Artists like Paula do not fall neatly into a particular art form, nor do they have the infrastructure of major performing arts organisations. They will have to fight to prove the ‘excellence’ of their work, when the benefits of it are evident enough. “The people who are most impacted [by the arts cuts] from what we know, are the individual artists, independent artists and the small to medium arts organisations,” says Norm Horton.